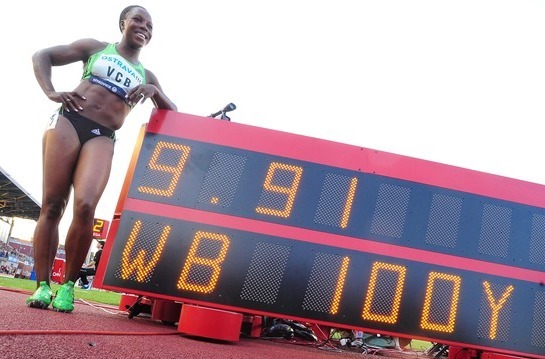 US-based sprinter, Veronica Campbell-Brown of Jamaica sets the 100 yards (91.44 m) World best with a time of 9.91s en route to win the women's 100 metres final at the IAAF World Athletics Challenge / Golden Spike in Ostrava (May 31, 2011). The previous World best at 100 yards was held by Chi Cheng of Chinese Taipei (!) with 10.10s set in Portland, USA in 1970. Well in the next a few days there will be a post to discus about Chi Cheng!. Campbell-Brown also improved on her 100 metres time, bettering 0.02s from her previous best time (10.78) set last year to 10.76s in which equaling Evelyn Ashford's time at the rank number eight at the all-time's 100m lists. Ironically Usain bolt also timed 9.91s (same to Campbell's 100 yards) in the men's 100 metres and equalled his season best from the Diamond league meeting last week. So, is it a gap (8.56 metres) for the 100 metres between men and women of the same level?. The Lightning Bolt crossed the 100 yards line in 9.14s, subsequently failed to break the 100 yards World best 9.07s set by Asafa Powell at the same meet last year.